Stop junk mail and nuisance phone calls? Want to stop getting unwanted marketing calls, faxes and junk mail? Is the tarmac on the stone quay just a temporary measure ? Or like our stone pavements, is everything going to be covered in bland black tarmac as the stones fall out owing to lack of maintenance? When will this be repaired? Remember, since Jan 1, under the FOI Act,anyone can ask to see any recorded info held by any public body. So, thats the Purbeck Transportation Study, Pierhead, Beach, jetty, old Grammar School plans, parking enforcement etc.etc. Everyone concerned about any of the above or, anything else should take full advantage. They have 20 days to cough up. It should be free of charge unless it costs more than £600 to provide. There is no reason to moan about lack of info any more. If you don't ask, you don't get. What do you think of plans to remove the 'cannonball' monument and replace it with a statue of Nelson? My feeling is that ADDING a new statue may enhance the attractively eccentric nature of Swanage. Perhaps make it small and pre-sling and patch, and give him a parrot. Not that Nelson has got much to do with Swanage.The Advertiser quotes the person proposing this as saying that "Swanage has such strong naval connections". Has it? 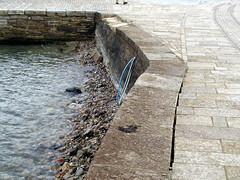 But let's not start on TAKING AWAY the odd anomalies that give Swanage its distinctively surreal character. The cannonball monument may be a strange way to commemorate the deaths of hundreds of Danish sailors in 877, but this it does. And why should they not be remembered? If this goes, what's next? The globe at Durslton? The iron bollards? The gothic columns? 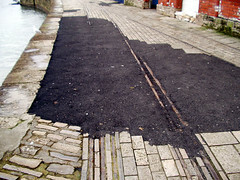 The rails on the quay ? (Oh, that's started already - looks like the process of tarmacing them over has begun). And while we're on the subject of monuments, perhaps it's time to reinstate the Albert memorial, which was removed some years ago and now languishes in a Purbeck quarry? Some action ought to be taken to prevent the overnight parking of motor caravans, other large vehicles used as accommodation, and tents, on the Ferry Road principally at the Shell Bay end. Some of these vehicles are parked for several weeks at a time,and have health and safety implications, as well as being unsightly in an Area of Outstanding Natural Beauty. Update from Nick Storer, sent to all interested parties (supporters and objectors). Following the rejection of our previous plans, and hopefully as an alternative to appealing them, we have worked over Christmas to amend the design to address many of the principal concerns of Local Residents and Councillors; we are convinced the Planning Officers will appreciate the merits of the improved scheme. * There has been a substantial reduction in the scale and massing of the building on the Pier corner of the site in order to ensure views of The Rookery remain completely unaffected on three sides. * The detailing and form of the building has been rethought and improved in order to reinforce the stand-alone qualities of the design. * Greater focus has been given to the context and setting, picking up themes, materials and the diversity of the area, whilst remaining essentially contemporary, exciting and sustainable. * Although unapparent from the elevations, the building features curved frontages, extensive tinted glazing and a predominantly copper roof instead of slate. The apartment layout remains much as before with a living area above shop/offices, and bedrooms in the roof. Each of the 14 units gets a garage and car space. Your questions, comments and suggestions are eagerly awaited, prior to further negotiations with Purbeck District Council. PDC are proposing a levy of about £6000 per new development unit to support the transport infrastuucture!!! £750 if you add a one bedroom extension to your home!!! I think if the four or five main takeaways around the Square were approached, by say the Mayor, an agreement could be made to employ a fulltime litter picker operating from the clock tower to the quay, at the shops’ expense. An advert-uniformed person would show Swanage takeaways really care about keeping our front clean and tidy. Meanwhile the beach wardens could give up a little of their strolling and coffee drinking time to support the effort!! !